Are you looking for a cruising experience that takes you to unexpected places? Are you searching for a vacation that has all of the luxury and relaxation of a cruise without the crowds? The Dodecanese Mosaic cruise takes you around the Aegean on a smaller craft which berths fewer than a hundred passengers, yet has all of the modern conveniences and features of a larger cruise ship. This cruise, embarking from the port of Agios Nikolas on the island of Crete, takes you to some of the Greek Island's more well known spots as well as some beautiful out of the way places while allowing you to stop, relax and unwind onboard a luxury craft. The cruise also has plenty of optional tours to fascinating ancient sites. To balance out the vacation, there are also plenty of stops for swimming, as well as time for relaxing and taking in the blue waters of this magical part of the world. The first day of your cruise starts when you arrive at the port of Agios Nikolaos to board the craft. Embarkation is between 3.00 and 4.00 p.m. The cabin crew will show you to your cabin and your holiday begins. This first evening on board will give you time to acquaint yourself with the boat and it's layout as well as meeting your fellow shipmates. The boat will make its way to Vai Baby, where the boat will stop so that you can have a swim in the blue waters off the East of Crete. Dinner will be served as the ship takes anchor in Vai Bay for the evening. Early in the morning, the boat sets sail for the island of Karpathos, to the east of Crete. The short journey will be broken up with a swim stop near the island. You will arrive in Pigadia, the main town on Karpathos around midday, where there will be a barbeque on board the boat for lunch. In the afternoon, an excursion onto the island will take place, showing you around this more traditional of the Dodecanese Islands. Until only a few decades ago, Karpathos was a very quiet and traditional island. Today, many of the quaint traditions still remain and the day's excursion will take you to some of the great places on this island. Arriving back at the boat in the late afternoon, the evening is yours to relax on board and enjoy dinner in the dining room as the boat sails towards the port of Lindos on the Island of Rhodes. 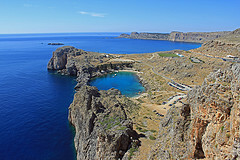 Early on the third morning of your cruise, the boat will land at the port o f Lindos on the island of Rhodes. After breakfast on board, you have a number of options for the morning. On offer is a tour of the town of Lindos which includes a trip to some of the archaeological wonders. The view from the ancient amphitheatre at the top of the town is astounding. For those not wanting to take the tour, there is always the option to relax on board the boat, swimming from the swimming platform at the back of the boat and taking it easy. Mid-morning, the boat will make the short trip up to the Port of Rhodes, where the boat will remain for the night. There is the option of dinner onboard, or you can make your way into this vibrant and bustling city and start to appreciate the wonders of the largest city in the Dodecanese Islands. 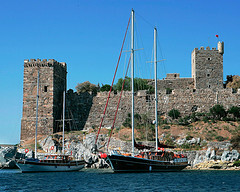 There is plenty to see in Rhodes Town, including the Palace of the Grand Master, the city walls and the Knight's Quarter. The restaurants in the city are as good as any in Greece. After breakfast you have the option to take a tour of the Old Town of Rhodes, one of the most picturesque and historically unique parts if the Dodecanese. The tour will take you to the main sights of the Old Town - a place which you could spend days exploring. Arriving back in the boat in time for lunch, the boat will sail to short distance to Symi, taking in a swim stop in Symi Bay. 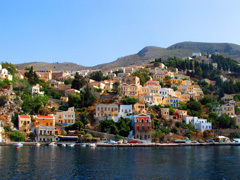 Symi is the island closest to the Turkish coast and you will arrive at the port in the late afternoon. This island is very different to most of the Greek Islands as there is none of the whitewashed buildings you would expect to see. Arriving at this time, you have a chance to wander around Symi Town and take in the ambiance. Dinner will be served on board in the dining room, or you may choose to find your dinner in the town. The boat will remain in Symi Harbour for the night. Early in the morning, the boat will make its way up the Turkish coast to the port of Bodrum, where you will disembark and take a tour of the ancient site of Halicarnassus and around the ancient town. People have lived in this area for thousands of years and the tour will take out the ancient sites as well as the medieval town with its castle built by the Knights Templar. This is a spellbinding morning taking in over two thousand years of history. After lunch, you will board the boat and make the long journey overnight to the island of Amorgos. This is a great chance for you to relax and enjoy yourself on board the boat, laying back and taking in some sun and making the most of the boat's amenities. This is the longest sea voyage you will take and it will give you a chance to reflect as you watch the islands pass you by. 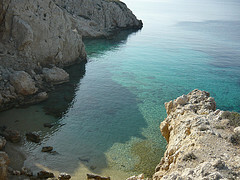 After the overnight voyage there will be an early morning swim stop in Amorgos Bay. After the swim, relish the amazing scenery that passes you by as the boat makes its way to Amorgos Town. 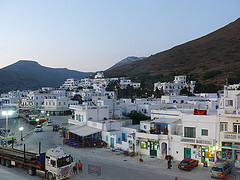 Amorgos has only recently become a tourist destination and it is still a very traditional, quieter part of the country. The island came to fame with the release of Luc Besson's film, "The Big Blue". After lunch, the boat will arrive in Amorgos Town where it will stay for the night. It will be worth you time to disembark and have a good look around this quieter, more traditional town, with its whitewashed buildings and winding streets. Amorgos can give you an idea of how life used to be in this part of the world. Dinner will be available on the boat, or you may choose to find a meal at one of the traditional taverns near the waterfront. Early in the morning, the boat will set sail on the penultimate day of the cruise. The first stop will be Manganari Beach on the island of Ios. After the swim, the boat sets sail for the magical island of Santorini. As the cliffs of this amazing island come into view, you will realise that you're present in one of the most spectacular islands in the world. Arriving in Santorini in the afternoon you can take an excursion to have a look around the island. Santorini has so much to offer the tourist, from the towns perched high on the cliff tops to the black sand beaches of Perissa and Perivolas to the most spectacular sunsets you will ever see from the town of Oia. 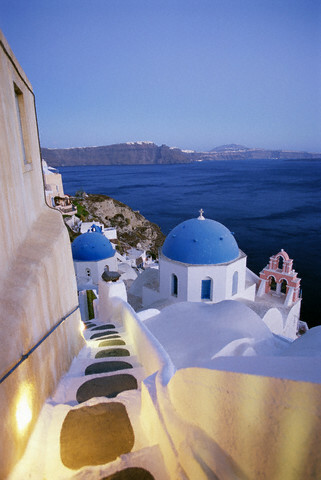 Your time in Santorini will be some of your most memorable of the trip. Late in the evening, after taking in all the island has to offer, the boat will make its final journey overnight back to Agios Nikolaos, Crete. 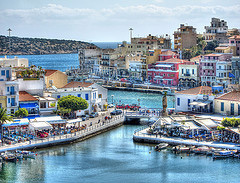 Arriving in Agios Nikolaos early in the morning, you will disembark the boat between eight and ten in the morning. Please contact us to make transfer and other forward arrangements.